HENSOMASTIK® Mixed Penetration Seal S 90 is used to seal penetrations for metal pipes, flammable pipes and electrical cables, thereby restoring the fire safety of wall and ceiling structures which contain openings for supply lines. In the event of fire, it prevents fire and smoke spreading through these openings for a fire-resistance time of 90 minutes. 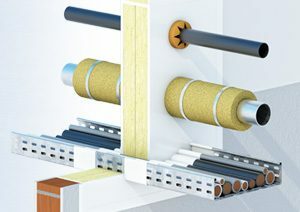 The HENSOMASTIK® Mixed Penetration Seal S 90 is a system which consists of 2x >60 mm thick Hardrock 040, ROCKWOOL RPI-15 mineral fibre boards or RPB 15 fire batt, which are coated on both sides with HENSOMASTIK® 5 KS Farbe or HENSOMASTIK® 5 KS viskos. The HENSOMASTIK® Mixed Penetration Seal S 90 contains no dangerous substances as defined in Directive 67/548/EEC and (EC) Directive No. 1272/2008, or as per the EGDS “Indicative List of Regulated Dangerous Substances” taking into account the installation conditions for the construction product and the resulting emission scenarios.